This past weekend Cardinal athletes performed very well at the Fiesta Tournament at St. Frances Cabrini parish. Both girls volleyball and boys flag football played games both days and won some hardware for Canyon Heights Academy! Grade 5 girls volleyball played hard and placed 3rd in the tournament. Amelia Ruiz was selected MVP after the final game. 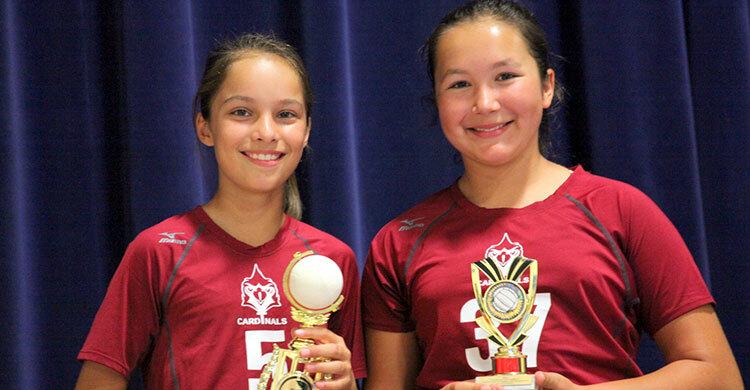 Grade 6 girls dominated play on the volleyball court and won the Championship trophy. Allie Soriano and Anjali Vieira were selected as MVP’s for their grade. Grade 5/6 boys played hard and placed 3rd overall. Keagan Rhodes was selected MVP after the consolation game. Grade 7/8 boys placed 4th in the tournament with a win, a loss and a tie. Darrin Rodricks was selected MVP. Canyon Heights Academy challenges athletes to reach their highest potential. Playing team sports promotes camaraderie, teamwork, discipline, sportsmanship and enjoyment of the sport. GO CARDINALS!